INDUSTRY.co.id - Jakarta - After the success of XL PRIORITAS Shopping Points service first, PT. XL Axiata Tbk (XL Axiata) presents New XL PRIORITAS Shopping Points with cash back and bonus unlimited internet data. This was conveyed at a press conference in Jakarta, on Wednesday (24/1). The Bundling Service with the largest cash back that is, cash back offers up to Rp9, 7 million in every smartphone purchase Galaxy Note 8, Samsung Galaxy S8 + and Samsung Galaxy S8 can be obtained at several outlets XL cooperation. They include, Erafone Store and Samsung Experience Store. In addition, unlimited Internet data bonus offers for all uses such as music, movies and customer needs. There are 3 choices of New XL PRIORITAS Shopping Points packages available. First, the Gold Package with a subscription fee of Rp 150 thousand / month with Cashback Shopping Points of Rp 900 thousand or Rp 2 million in accordance with the choice of 12 or 24 month subscription period. Second, Platinum Package, subscription fee Rp 250 thousand / month with cash back option Rp 2 million or Rp 4 million. Third, Diamond Package, subscription fee Rp 450 thousand / month with cash back option Rp 3.5 million or Rp 7 million. Cashback Shopping Points can be redeemed for the latest 4G or 4.5G smartphones. That way, Customers will get the desired smartphone at a cheaper price or even for free. Through this service, customers can also enjoy unlimited calling and SMS to fellow XL, unlimited chat, send pictures and video calls in applications such as Whatsapp, LINE, and BBM. Customers can also get unlimited access free bonuses and free subscription fees for yonder music provider apps, movies from iflix and unlimited data access every month. Special Bonus can be enjoyed after Customer using base rate or buy additional package (booster) up to the minimum limit that has been determined. For Gold is 100ribu, Platinum 150ribu and Diamond 200ribu. Customers can also choose various payment methods according to keingingan that is 0% installment for 12 months or 24 months, or can also pay upfront cash. 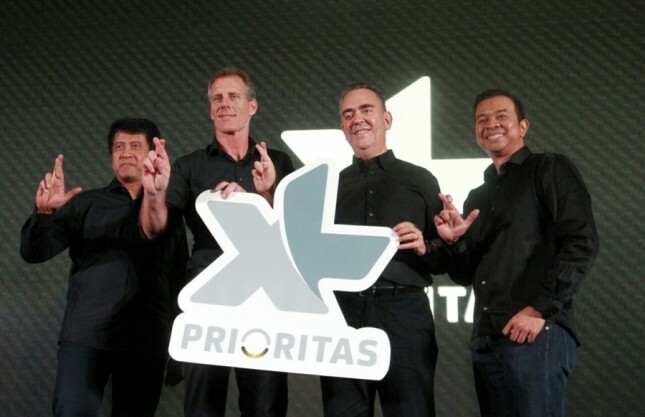 "Based on XL PRIORITAS customers' ever-increasing need for best-performing smartphones, XL PRIORITAS continues to update the service by re-launching the latest XL PRIORITAS Shoping Points service with greater cashback Shopping Points and unlimited data bonuses. We hope that this service can further enhance the community and customers to get the 4G and 4.5G smartphones they need with the support of quality telecommunication services from XL PRIORITAS. "Close Chief Premium Segment Officer XL Axiata, Rashad Javier Sanchez.